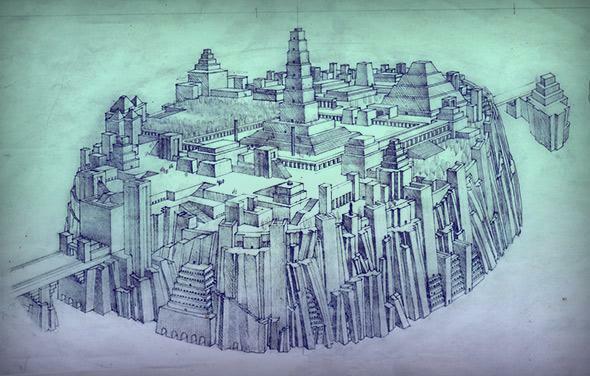 I met with the world’s leading Atlantis expert: Will we ever locate Plato’s sunken city? I met with the world’s leading Atlantologist to separate fact from myth. Stavros Papamarinopoulos could’ve been a character in a John le Carré novel. He had arranged for us to meet at an empty suite of offices belonging to his economist friend in the unfashionable port city of Patras. This had required me to ride a bus for four hours from Athens. Papamarinopoulos is a professor of geophysics at the University of Patras. He is also the world’s most respected Atlantis expert. “Plato did, in the Phaedrus,” I said. I didn’t mention that I’d learned this about two hours earlier while reading one of Papamarinopoulos’ essays on the bus from Athens, but I suspected that he knew. In the Phaedrus, Plato has Socrates explain how a subject can be isolated then divided into smaller chunks and analyzed until it becomes understandable. Until fairly recently the Athens half of Plato’s tale has been almost completely ignored by Atlantologists. Yet Plato’s precise descriptions of the ancient Mycenaean city—the evidence of which had been buried for several centuries at the time he wrote and of which no written records remain—have been shown to be remarkably accurate. In the 1930s the archaeologist Oscar Broneer was excavating at the Acropolis when he located a subterranean spring that had evidently been smothered by the debris from an earthquake. Relics found in the bottom of the spring dated to around 1200 B.C. Mycenaean-era housing similar to that used by Plato’s ancient warriors has also been uncovered on the northern slope of the rock, exactly where he placed it in the Critias. “So if Atlantis wasn’t in the middle of the Atlantic, where was it?” I asked. “Who were the Atlanteans? Plato gave one name to a coalition of different nations that came and invaded the eastern Mediterranean. We have the names of these people written in hieroglyphics in Medinet Habu, in a victorious granite stele.” Medinet Habu is one of the archeological treasures of Egypt. It was built as the mortuary temple of the great pharaoh Ramses III, who reigned from roughly 1186 B.C. to 1155 B.C. Its walls contain some of the most spectacular hieroglyphics in existence. Papamarinopoulos believed that these invaders, generally referred to by historians as the Sea Peoples, had come from a giant nesos that was not an island but a giant peninsula—one encompassing all of mainland Europe west of Italy. One part of Plato’s text, however, had always confused me. Atlantis, he wrote, was the way to other islands, and from these you might pass to the whole of the opposite continent which surrounded the true ocean; for this sea which is within the Straits of Heracles is only a harbor, having a narrow entrance, but that other is a real sea, and the surrounding land may be most truly called a boundless continent. Excerpted from Meet Me in Atlantis: My Obsessive Quest to Find the Sunken City by Mark Adams. Out now from Dutton.